Dr. Luke is the newest member to our team at Advantage Chiropractic Centers, recently graduating in November 2014. He is eager to join a great profession while helping people live healthier lifestyles and reach their ultimate goals through chiropractic care. He is a graduate of Rochester Area High School, and went on to receive his bachelor’s degree majoring in Neuroscience at Thiel College in Greenville, PA. Dr. Luke went on to receive his Doctorate of Chiropractic degree from New York Chiropractic College in Seneca Falls, NY. Dr. Luke enjoyed playing baseball and football during his high school days, as he also went on to play baseball at the collegiate level. 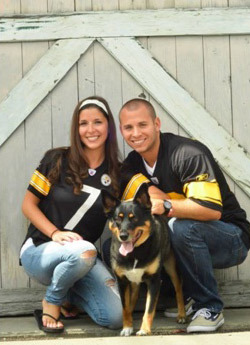 He is “die hard” Pittsburgh Steelers, Penguins, and Pirates fan. When he is not seeing patients he enjoys spending time with his family, playing golf, and fishing. He plans to marry his fiancee Emilee in July 2015. Are you a good candidate for chiropractic care? Find out! Call Advantage Chiropractic Centers today!